TOKYO - A big brown cockroach crawls across the table in the laboratory of Japan's most prestigious university. The researcher eyes it nervously, but he doesn't go for the bug spray. He grabs the remote. This is no ordinary under-the-refrigerator type bug. 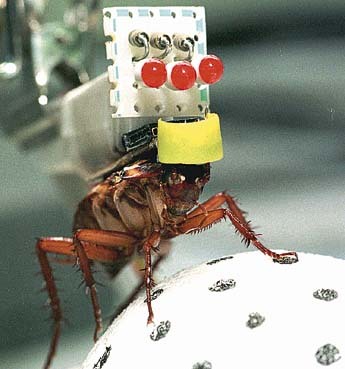 This roach has been surgically implanted with a micro-robotic backpack that allows researchers to control its movements. This is Robo-roach. "Insects can do many things that people can't, " said Assistant Professor Isao Shimoyama, head of the bio-robot research team at Tokyo University. "The potential applications of this work for mankind could be immense." Within a few years, Shimoyama says, electronically controlled insects carrying mini-cameras or other sensory devices could be used for a variety of sensitive missions - like crawling through earthquake rubble to search for victims, or slipping under doors on espionage surveillance. Far-fetched as that might seem, the Japanese government has deemed the research credible enough to award $5 million to Shimoyama's micro-robotics team and biologists at Tsukuba University, a leading science center in central Japan. Money from the five-year grant started coming in this month, and young researchers are lining up for a slot on Shimoyama's team. The team breeds its own supply of several hundred cockroaches in plastic bins. Not just any roach will do. Researchers use only the american cockroach (Perplaneta americana) because it is bigger and hardier than most other species. From that supply, they select roaches to equip with high-tech "backpacks" - tiny microprocessor and electrode sets. Before surgery, researchers gas the roach with carbon dioxide. Wings and antennae are removed. Where the antennae used to be researchers fit pulse-emitting electrodes. With a remote, researchers send signals to the backpacks, which stimulate the electrodes. The pulsing electrodes make the roach turn left, turn right, scamper forward or spring backward. Over the past three years, researchers have reduced the weight of the backpacks to one-tenth of an ounce, or about twice the weight of the roaches themselves. "Cockroaches are very strong," said Swiss researcher Raphael Holzer, part of the Tokyo University team. "They can lift 20 times their own weight." The controls, however, still have a few serious bugs of their own. Holzer jolts a roach with an electric pulse to make it move slightly to the right and keep to an inch-wide path. Instead, the roach races off the edge of a table into Holzer's outstretched hands. "The placement of the electrodes is till very inexact," he admits, settling the bug back on the track. While a backpack-fitted roach can survive for several months, it becomes less sensitive to the electronic pulses over time - a big problem if the bugs are to be used on longer missions. Holzer is optimistic. "The technology isn't so difficult," he said. "The difficulty is to really understand what is happening in the nervous system." And technology aside, Robo-roach is still, after all, a roach. "They are not very nice insects," Holzer confesses. "They are a little bit smelly, and there's something about the way they move their antennae. But they look nicer when you put a little circuit on their backs and remove their wings."